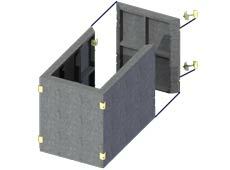 Fibercrete Modular Ground Sleeve Panels | used to support any utility pad mount electrical apparatus. Our ground sleeves provide a stable and attractive base for any utility pad mount apparatus. The long list of panel sizes creates a vast array of available box size combinations. Fibercrete material ensures long product life via resistance to fire, corrosion, rodents, UV rays, temperature extremes, rain, and sudden impact. Vertical shifting after install is prevented by the patented interlocking wall design. Light-weight panels are purchased individually; a harware kit is included with every set of 4 panels. MGS can be customized with knockouts (KO) and covers. Ground sleeves can also be stacked to achieve a deeper box. and we'll help to identify the perfect ground sleeve for your project. *Opening size of the assembled MGS box is 5 inches smaller than the corrosponding outside dimension.